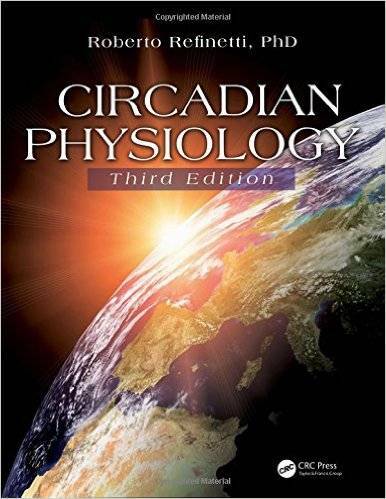 Roberto Refinetti PhD, "Circadian Physiology, Third Edition"
Biological processes that repeat themselves every 24 hours within a biological system are called circadian rhythms. Circadian rhythms are generated by the circadian clock, which affects the operation of practically every function in the body. Now in its third edition, this book presents the latest information on basic research in circadian biology and its applications in business and medicine. The book reviews the history of the field, explains classical and novel research methods, explores behavioral, physiological, and ecological processes, and describes neural and molecular mechanisms of circadian rhythmicity. It also examines applications in the selection of the optimal timing for work and play, prevention of jet lag, avoidance of the shift-work malaise, and treatment of sleep disorders and psychiatric illnesses.